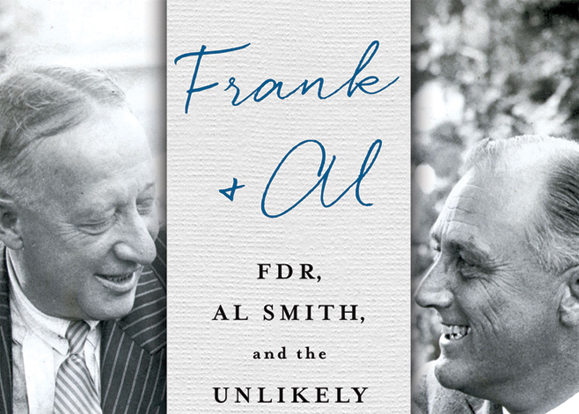 Frank and Al: FDR, Al Smith, and the Unlikely Alliance and Epic Feud that Created the Modern Democratic Party by Terry Golway allows readers to see the massive change to the Democratic party that both Franklin Delano Roosevelt and Al Smith ushered in during the mid- 20th century. While these men came from complete opposite sides of the spectrum, Roosevelt from the Protestant rich upper echelon of New York and Smith from the Catholic working class saw the corruption and mistakes that the New York political establishment Tammany Hall created, and knew that it needed to change if the Democratic party wanted to survive. Golway, who works as a senior editor at POLITICO, has written on various aspects of American life, more specifically on Irish-American life, from his study on the famous Irish-American institution that was Tammany Hall in Machine Made: Tammany Hall and the Creation of Modern American Politics to his exploration of Irish-American assistance in Irish rebellions with Irish Rebel: John Devoy and America’s Fight for Ireland’s Freedom. Known for his colorful descriptions of New York City and its people’s political and philosophical ideas, he enables the reader to become fully immersed in the subjects’ world. At the beginning of Frank & Al, Golway delves into the early lives of the two men, comparing and contrasting their upbringings to establish the differences between them. Smith grew up and lived amongst the Irish and Italian working-class tenements while Roosevelt was reared amongst the rich upper echelon of the old New York families. As the reader follows the men’s introductions into New York politics, we see how their political philosophies develop and eventually change. Al Smith was ushered into politics under the political wing that was Tammany Hall and Roosevelt, whose cousin had been recently president, stuck his nose up at men like Al Smith due to the corrupt dealings Tammany Hall was known for. While in the beginning of their careers they were often at odds, they came together eventually to pursue progressive and compassionate ideals that would usher in a united and newly formed Democratic party as well as a lasting friendship. Golway enables the reader to understand these developments through the lenses of famous historical events like the Triangle Shirtwaist Factory fire and others such as the Malbone Street Wreck, Prohibition, and the two world wars. The Triangle Shirtwaist Factory fire had a lasting impact on Al Smith as he saw the effects of the terrible working conditions that thousands of New Yorkers had to endure on a daily basis, especially the women (many of whom were members of Smith’s district) that were forced to jump out of factory windows to escape the fires. Smith soon acted after visiting the morgues and the victims’ families and enabled massive employment reform, with the help of unlikely political figures for the time, Belle Moskowitz and Frances Perkins. These amazing women made massive impacts on not only New York politics but national politics as well, as they helped to develop and run the Factory Investigating Commission and the Reconstruction Committee, both of which sought to solve issues of the American working classes. These issues ranged from poor housing and chronic unemployment to public health. If these committees and their actions sound familiar, they are often considered precursors to Roosevelt’s New Deal that was enacted almost 20 years later.